Error 645 Discussion Board If the fixes below didn't work... Post your problem / solution here!! Error 645 from Microsoft Dial Up Networking "Internal Authentication Error"
Error 645 - Dial-Up Networking could not complete the connection to the server. Communications, and then click Dial-Up Networking. 2. Right-click the icon for your connection, and then click Properties. 4. Enable Software Compression and TCP/IP should be the only two property boxes check marked. What's A Modem Init String? Try adding modem init string ATZ. This seems to work with many laptop computers. Try moving modem card to another PCMCIA card socket. 3. Click Dial-Up Adapter, and then click Remove. 5. When you are prompted to restart your computer, click No. 7. On the Windows Setup tab, click Communications, and then click Details. 8. 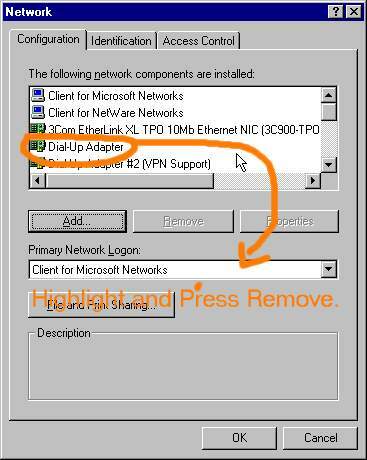 Click the Dial-Up Networking check box to clear it. 9. Click OK until you return to Windows. 10. Close Control Panel, and then restart the computer. 11. Go to My Computer, Dial Up Networking, and try to reconnect. Make sure that Log onto Networks, IPX/SPX, NetBeui is uncheck marked in Server Types. Delete all existing connectoids in DUN, as well as shortcut to desktop. Go into Control Panel, Network and remove all components. In Control Panel, Add/Remove programs, recheck connection, click ok.
Go into control panel, Network, Add Client for Microsoft Network, Dial up Adapter, Tcp/IP. Log off ...? Existing profile, log on?